My husband and I had been making our big plans to get motorcycles. He's ridden on two wheels before four. Me, never touched a bike before! At 5'2" I was always told I was way too short to ride. Walked into the Harley dealership inquiring about lessons for me - were had a long day planned of grocery shopping and catching a movie. Walked out with a 2005 1200c Sportster. We got a great deal and the previous owner really put a lot of love into it. It's a beautiful bike - dripping with chrome and sounding like a beast with Vance & Hines exhaust system. Had to switch from the forward controls it had originally to mid controls (my legs just barely touch the forward ones, mid is more comfortable for me). I'm just between being flat-footed and on the balls of my feet - my next adjustment may be a seat to help give me a little bit more leg room. So, I took the riders edge Harley class and am slowly (but surely) learning to ride and be at home on my new sporty. The deal is once I get to the point where I'm riding the sporty like I was born to my husband gets to get himself a bike too. I would be lying if I didn't tell you the bike sizes makes me a little nervous BUT I think its mostly because I have a healthy respect for its power. But, it feels good. I rode it before my riders edge class and did pretty good (even with forward controls) but laid it down. It was my first time on a bike and I didn't really understand the power of the front brake (or that the CLUTCH is my best friend, not the front brake! lol) Thankfully, it just has a few scrapes on the mirror, clutch level and taillight. Nothing too terrible. I didn't touch it again until after the course because I wanted professionals to teach me first. The bike is pretty comfortable actually. I mean, its not as easy to handle as the riders edge buell blast but it doesn't feel unmanageable. I can push it forward/backward no problem but you're right it may be a little front-end heavy. At low speeds the cornering feels heavy but in class we learned (and felt) that bikes feel less stable cornering at very low speeds and once you pick up your speed (even still in 1st gear but probably the top-end of 1st gear) your bike feels a lot lighter and more nimble. Also, those buell blasts were tempermental. I stalled them all the time and sputtered around at low speeds. But my sporty doesn't let me stall. It pulls foward just ever so slightly as I ease the clutch out. That bigger, smoother engine is much more forgiving. It makes stabilizing quickly much easier and more comfortable. And, it weighs about 562 lbs (the blast being about 362). The 883 weighs 555 lbs. So, the weight difference between the 1200 and 883 is not much at all. And, to be honest I wouldn't try to lift either bike if I laid them down unless I had to. I laid the blast down too and about 5 guys in the class jumped off their bike to pick it up for me. I laid the blast down twice actually, the second time I turned too slow on a tight curve and the bike like just fell over under me. I was just barely able to catch it enough to ease it down. The HD dealership I bought mine from told me not to worry about trying to pick my bike up. The hope is the Sporty is a bike I can learn on AND still be happy with in the long run. And, if I did want to trade up or to a sport bike it would maintain its value better. 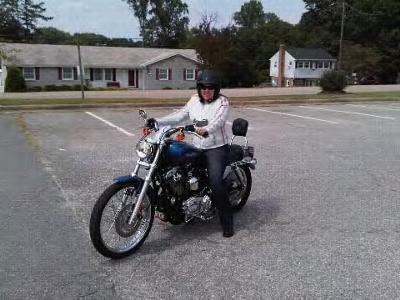 I'm a brand new rider too and I have a 2009 sportster. I've maybe ridden for 1400 kms.... I have dropped it a few times but after getting the feel for it I can't stand riding anything else. It's a great bike, and pretty too. Learning on a bigger bike9ie 1200) has it's advantages, and when it's time to move on, it will probably be easier then you think. My husband who rides an Electra Glide classis says that his is easier to handle than mine and he thinks thatmine is top heavy compared to his. Enjoy your beautiful new bike. My bike is 542lbs and I have lifted it up. Your first bike is a 1200 cc, whoa... Everyone I talked to or see on the boards always say start from 250 to 650. How heavy is the bike for you? Can you lift it. Yesterday I went and sat on the Sportster 883cc. Salesmen told me most start out at 883 or 1000cc..